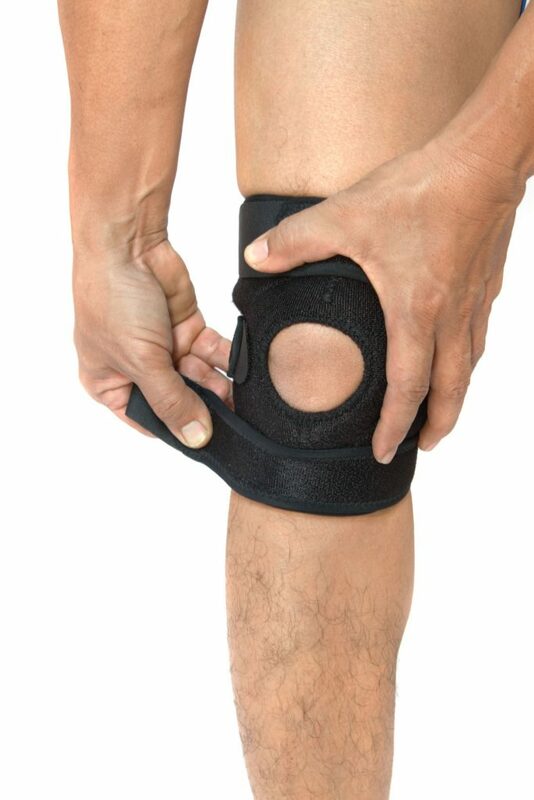 It is not uncommon to hear clicking or clunking noises from your replacement knee. It can sound alarming, as if there is something wrong with your knee and that it is not secure, however, there is nothing to worry about. This is often a natural sound made by the metal or plastic surfaces of your replacement knee engaging with each other. It can typically be rectified by the way you do things such as modifying the way you get up out of a chair or altering the type of exercise you do. The noise will normally stop after a period of time. However, if it does not, the noise may be due to other reasons. In addition, if you are getting pain, swelling or discomfort from the knee, or if the knee appears to have any abnormal deformity, you should contact your orthopaedic surgeon. The clicking or clunking noise may be due to a number of possible causes. It could be a noise made by the metal and plastic of the prosthetic itself, or it might be due to the tendons around the joint or fluid in the knee joint. 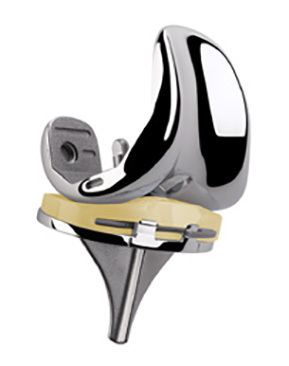 In total knee arthroplasty, your knee joint will be replaced with an artificial implant. There are many different brands and designs of implant constructed from various materials such as plastic, metal alloy or ceramic. The metal used is a titanium or cobalt-chromium based alloy, and the plastic is an ultra high molecular weight polyethylene. Mr Rajaratnam favours the Persona and Vanguard Knee System (from Zimmer Biomet). Typically an implant will consist of a metal component which attaches around the distal end of the femur, and which is grooved so that the kneecap can move smoothly on its surface. The proximal end of the tibia has a flat metal platform attached, often via a basal stem which fits into the tibia. Between the femur and tibia is a polyethylene plastic spacer cushion on which the end of the femur can articulate. The inner surface of the patella is sometimes replaced by a lozenge or dome shaped polyethylene layer. The prosthetic is designed so that a moving metal part will adjoin a plastic part which makes for smoother movement and a longer life for the prosthetic. Different surgeons use different methods to attach the implant but the fixes are invariably very solid, and it is very unusual for movement in the implant unit to be the cause of the clicking noise. What happens in the replacement knee to make it click? The first and most obvious reason for the noise is that of the metal end of the femur engaging with the plastic spacer cushion between the femur and the tibia. The original rubbery cartilage which covered the ends of the femur and tibia and which used to act as a shock absorber is no longer present. Therefore the noise of the metal and plastic acting upon each other might be heard. Noise also might come from the action of the new kneecap. When you are in a standing position there is a space between the inner surface of the kneecap and the metal surface of the end of the femur. As you extend the leg the kneecap moves off and then clicks back towards the metal femoral implant. The clicking noise doesn’t happen immediately after surgery because swelling in the joint makes all the components bind tightly together. As the swelling reduces there is more movement between the kneecap and the metal end of the femur and the clicking sound is heard. After rehabilitation, about 3 months, the joint is working normally and there should be no clicking noise heard. There should be no pain associated with this phenomenon. Also the tendons may have become slack after the operation and are not strong enough to hold the implant taught. However, as the leg muscles and tendons get stronger the body tissue will grow around the implant and help to settle it in place, which will also reduce any noise coming from the prosthetic. As the length of time after the operation increases, one would expect the chance of noise coming from the implant to decrease. However, If the noise suddenly occurs after a number of years of use, it may be due to the parts becoming loose. Wear is inevitable, and the implant which was a perfect fit at the time of the operation might not to be as tight after many years of use. Another reason is that scar tissue can form in your knee after total knee arthroplasty. It can form a dense fibrous tissue on the back of the kneecap. When flexing the leg this fibrous mass gets trapped in the femoral notch at the end of the femur. When the knee is straightened the fibrous mass pops out of the notch making a clunking sound. This is a painful condition known as ‘patellar clunk syndrome’. 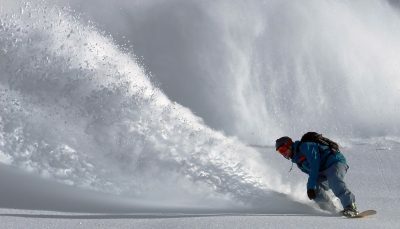 The condition may be cured with arthroscopic treatment. If you can keep your knee as flexible as possible, and build up muscle and strength there is the best possible opportunity to secure a successful outcome. Physiotherapy will always help after knee replacement surgery, but if you are at all worried by the noises made, particularly if it is accompanied by pain, swelling, joint deformity or if the wound is not healing well, you should consult your orthopaedic surgeon. 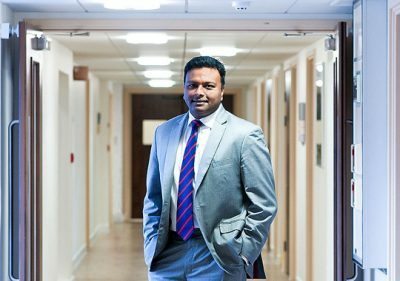 The Schoen Clinic is situated on Wigmore Street, London in the Harley Street Medical area. It is within easy access of Bond Street and Oxford Circus underground stations with good rail and road links to London’s main airports. Please allow additional travelling time for your appointment or admission.